Here is a handy tool that keeps your floors clean by applying a plastic cover on your shoe. The Automatic Shoe Cover Dispenser is pretty easy to use. Just slide your foot through it to have a thin sheet of clear plastic covering the bottom and sides of your shoe. Step on the foot switch to cut the film and heat seal the plastic. 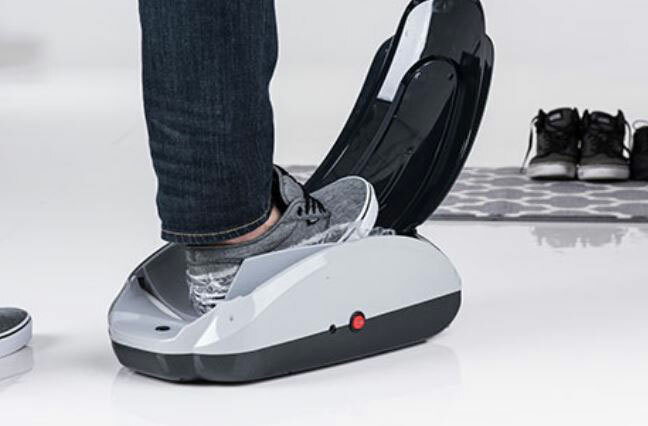 This device is expected to work with most shoes, sneakers, and boots. It is secured to the floor with suction cups.